So where will you be this Valentine's Day? As they say... the way to a man / woman's heart is through his/her stomach it's a good thing that Spot.ph came out with this amazing listing of all the Valentine's Day promotions around the Metro :) This will be a running list where I will be adding more entries as we get closer to the V-Day! Indulge with 22 Prime’s dinner buffet and Prime rib carving station on February 13, Saturday and February 14, Sunday at P1,400+ per person. Adarna is giving a 20% discount on all bottles of wine for the whole month of February. A tertulia, ‘PS. Mahal Kita,” and a love letter reading contest will be held on February 13, Saturday at 7 p.m., wherein guests will be providing the entertainment. Duck Foie gras praline in Madeira jelly, Cream of green asparagus with smoked Wagyu beef and black truffle, Grilled lobster tail and scallop tortelloni will be served at Aubergine for P2,250+ per person. You may also choose from the Grilled Australian Mulwarra beef tenderloin and Roasted Australian lamb rack, Duck trio or Grilled Chilean sea bass as the main entrée. Desserts, coffee and tea will be served. Menu is available for dinner only on February 13, Saturday and February 14, Sunday. Go Italian on Valentine’s Day and enjoy Carpaccio’s set menu at P850+ per person. The menu includes Insalata con Funghi e Pancetta (fresh garden greens with yogurt herb dressing) or Cappuccino di Pomodori (light tomato soup topped with cream), a choice between Norwegian salmon fillet or ham and cheese-stuffed chicken breast. Orange Sandwich Cakes will be served for dessert. Menu is available for dinner on February 13, Saturday and February 14, Sunday. Cav’s prixe fixe menu on Valentine’s Day is at P 1,600 per person and includes Veal Carpaccio or Smoked Salmon, Iberico Pierogi or Duck Consommé, and a choice of Melbourne Prime Beef Tenderloin, Grilled Tiger Prawns or Crispy Lamb Belly for the main entrée. Dessert is a choice of Chocolate Terrine or Champagne & Strawberries. You may add Melbourne Prime Beef Truffles for an additional P500. Moet Chandon Champagne is available by the glass or you may upgrade your meal with wine pairing for each course for an additional P990. On February 13, Saturday, Chateau 1771’s special menu includes: Oxtail Canneloni and Baked Brie on Filo with Prosciutto as appetizers; Bouillabaise of Scallops, Wild Mushroom soup with white truffle foam, Pear, Mesclun, Blue Cheese and walnut vinaigrette salad and strawberries, pistachio nuts, crispy bacon and white balsamic dressing salad. Main course choices include: Lobster with orange butter and almond, Halibut wrapped in pancetta, Roasted Philippine seabass, Striploin steak with Tomato Madeira sauce, Veal chops with Port wine sauce, Rack of lamb and sauce vierge. Dessert Platters are also available. All dishes may be ordered a la carte. The regular menu will be available on Friday, February 12, lunch on February 13, Saturday and February 14, Sunday. On the menu at Chef Laudico Bistro Filipino on Valentine’s Day weekend: Sinigang Taro puree soup with roasted tomatoes, Baked tomato stuffed with smoked milkfish on mesclun salad, Ravioli stuffed with laing topped with seared prawns in coconut capsicum sauce, Roast U.S. Angus Beef and white chocolate bread and butter pudding with dulce de leche and chocolate truffle ice cream. Dinner is at P1,500 per person. You may also add three glass wine pairings for an additional P500. Menu is available on February 13, Saturday and February 14, Sunday. A la carte items will not be available on February 14. Seven Corners will have a sumptuous buffet spread for P2,200+ per person, which will include Japanese, Indian, Noodles (Asian Noodles & Pasta) and Western interactive cooking stations. U.S. Prime Rib Steak and Steak Tartar will also be served on February 13 and 14. Desserts will be a treat at Seven Corners with the Chocolate and Strawberry Pizza, Chocolate Chili Mousse and Strawberry Chili Crème Brulee. A glass of sparkling wine will be served with the buffet. Over at Xin Tian Di, two sets of a seven-course menu will be served on Sunday, February 14 for P1,480 per person. Couples can share a meal that begins with either a Trio of Dimsum Platter and Assorted Seafood and Jellyfish Salad in Red Wine Sauce. Main courses include Pan-fried Pork Loin in White Pepper Sauce, Blue Berry Fish Roll or the Asian inspired Poached Seasonal Vegetables and Bean curd with 3 Kinds of Eggs. The Valentine’s menu will be served with a glass of sparkling wine.Couples who dine at Crowne Plaza Galleria’s restaurants on February 13 and 14 will also get a chance to win a romantic travel showcase to Bali, Indonesia inclusive of roundtrip tickets for two to Jakarta via Cebu Pacific and a 3-day/ 2-night stay with dinner for two at Holiday Inn Baruna Bali plus a P5, 000 gift certificate for signature luggage from Flight 360. Enjoy splendid set menus for lunch and dinner at the Restaurant Le Bellevue for only P2,500+ per person, which includes a glass of Rosé wine plus a box of pralines and roses for the ladies during dinner. The Palm Court Cafe lunch buffet is at P1,500+ per person while the Valentine dinner buffet will have a seafood spread for only P 1,988+ per person. The dinner buffet includes a glass of Rosé wine plus a box of pralines and roses for the ladies. Over at Kaizeki, their lunch set menus are at P1,500+ per person for lunch and P1,988+ per person for dinner. The set menus include a glass of Rosé wine or Sake, a Japanese wine, plus a box of pralines and roses for the ladies. You may choose to spend your Valentine’s Day date with a bountiful barbeque by the poolside. The Barbeque Dinner Buffet on February 12, Friday and February 13, Saturday is at P1,500 per person with a glass of red wine and roses for the ladies. Head to The Sky Lounge Music Bar for an after-dinner party on February 12, Friday and February 13, Saturday and enjoy a glass of Rosé wine and sensational music provided by guest bands for P688 per person. Tosca will serve a four-course and a three-course set menu for dinner on February 14, Sunday. On the menu: Lobster and sea scallop on tomato carpaccio with light saffron vinaigrette, Spinach sour crème soup with beetroot ravioli, Lapu-lapu fillet and prawns on yellow bell pepper sauce or Beef tenderloin in red wine sauce and Strawberry - lemon variation. The four-course menu is at P1,960 and the three-course menu is at P1,710. The dinner comes with one glass of Moet Chandon Champagne. Benjarong Thai Restaurant’s dinner set menu is at P1,600 per person. The menu includes Flower shaped dumpling filled with minced chicken, Steamed minced pork, Prawn salad, Chicken wings in hot and sour clear soup in coconut shell, Deep-fried lapu-lapu fillet with pineapple gravy, Stir-fried pork spareribs with chili sauce, Stir-fried vegetables with prawns with steamed Jasmine rice. Enjoy dinner at Umu on February 14, Sunday with the Japanese set menu at P2,600 per person. The menu includes Baked eel futomaki sushi rolls, Oyster karaage, Hamachi, salmon, toro sashimi, Salmon miso Ishikari style, Chilean seabass fillet teppanyaki, Beef saikoro steak, Mixed vegetables and Cheese mousse, Japanese style pudding and green tea-flavored mochi ice cream for dessert. Chef Jessie Sincioco of Enchanté at the Oakwood Premier Joy Nostalge Center in Ortigas will be serving Trio of Goose Liver, Poached Canadian jumbo scallop in Andalouse sauce, Oxtail soup en croute, Pan-fried Norwegian Lemon sole fillet or Roast chilled U.S. Black Angus striploin and a trio of new desserts that include Dark chocolate macadamia nut slice, Strawberry panna cotta and Grand Marnier crepe. Coffee, tea and strawberries dipped in chocolate will also be served. The Valentine’s Day menu is at P2,500 per person. The menu is available for lunch and dinner on February 14, Sunday. Make the Establishment your date venue for Valentine’s and enjoy delectable dishes from the Crystal Room and The Hall for P1,500+ per person. The menu includes Tuna Belly Sashimi on Crispy Pita Crust, Manila Clam Miso Soup, Sesame Crusted Goat Cheese salad, Sake Poached Chilean seabass or U.S. Angus Tenderloin Beef Miso Zuke, and white chocolate crème brulee. The menu is available on February 13, Saturday and February 14, Sunday and comes with a glass of wine per guest. Diners can avail of their special Iced Tea flavor -- Three Berry Iced Tea! Available only from February 12 - 14, 2010. 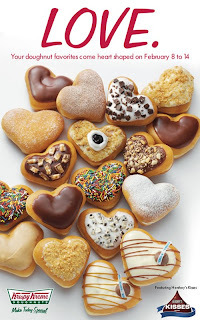 From February 8 - 14, 2010, all of your favorite doughnut varieties will come in heart shapes! Share a dozen for only Php365. Roses and Chocolates for Valentine's Day. We all know that they two makes a perfect pair when it comes to showing your loved ones how special they are this happy heart's day. Red Ribbon now has a new mouthwatering masterpiece called the Roses & Kisses Cake (Php. 330). Beautiful sugar roses and Creamy Hershey's Milk Chocolate Kisses come together in a unique heart-shaped chocolate pound cake with chocolate fudge filling sprinkled with chocolate chips. Nothing will make your Valentine's Day more sweeter than this! This special cake is only available from February 12 - 14 in all Red Ribbon outlets. omigosh, franny! i got hungwy! How about you and P?